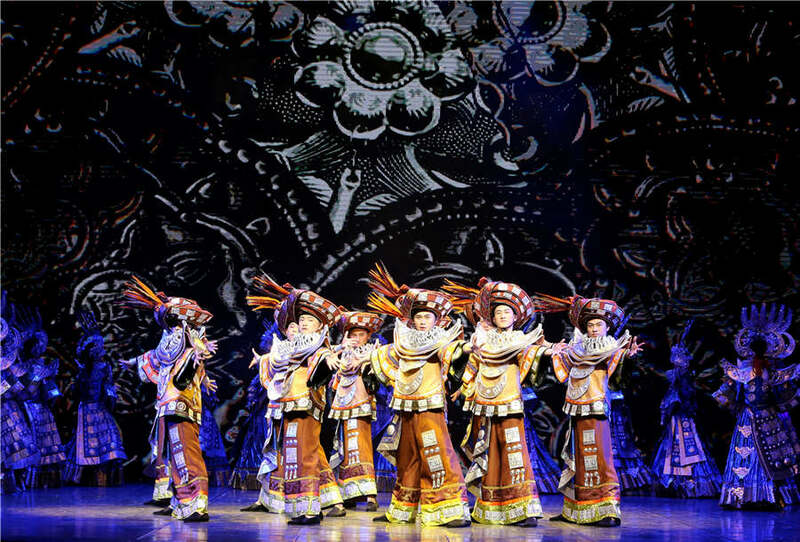 A gala performance to mark the beginning of Guizhou Culture Week, a part of the China Shanghai International Arts Festival, was held at the Shanghai Grand Theatre on Oct 26. Titled Colors in Harmony, the gala featured more than 30 intangible cultural heritages of the southwestern Chinese province, such as the UNESCO-listed polyphonic choir Kam Grand Song, and dozens of other heritages. "The five big minority ethnic groups have lived in Guizhou for generations and developed rich cultural heritage. These had to be portrayed through stage and costume design as well as choreography," said Tan Pei, the playwright for the show. Tan added that such precious cultural heritages are gradually being lost as more and more young people from the province leave their homes for urban areas to lead modern lives. "We hope that presenting these heritages can inspire greater public interest and help promote our culture," she added. Following the theater performance, artists will present highlights of the show in outdoor venues such as the space outside the Shanghai Concert Hall, Jing'an Park and Zhongshan Park. Also featured at the Guizhou Culture Week is Moonlight on the Ferry, a folk opera show about a liquor brewhouse which is being shown at Yifu Stage on Oct 28. There will be an exhibition at the China Shanghai Art Museum from Oct 26 to Nov 13 that showcases the works of various artists from Guizhou.